When it comes to housing exteriors, there are two popular synthetic options: vinyl siding and hardie board. Vinyl siding was introduced in the 1960s, quickly becoming an attractive alternative to aluminum siding. It is made from PVC, which makes it extremely durable. Today, it is the single most popular siding material for homes in the United States. Hardie board is a fiber-cement board made from sand, cement, and wood fibers that was introduced in the 1980s as an alternative to vinyl siding. Like vinyl, it’s very durable. It is also quickly becoming a popular option for housing exteriors. Which one is right for your home? The answer depends on many factors, like the importance you place on durability, aesthetics, maintenance, cost, energy-efficiency, and eco-friendliness. Vinyl siding became an appealing alternative to real wood due to its durability and typically comes with a 25-year warranty. Because it is made of plastic, it never requires painting, and it is resistant to water, wind, and weather damage. However, it can be damaged, particularly because it is very thin (usually .04 to .046 inches thick). Rocks, tools, and other sharp objects can puncture vinyl. 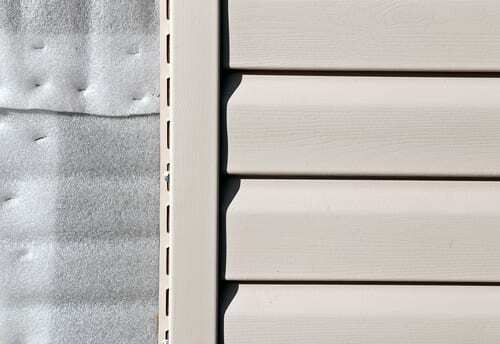 Vinyl siding is also prone to becoming brittle with age and exposure to cold or heat. When this happens, it is much weaker, and can be damaged by hail, wind-blown debris, or even an errant baseball! And while vinyl siding is treated with fire retardant, that only slows down the rate at which it can burn if exposed to fire or another heat source. In fact, heat – whether from fire, a nearby grill, or even the reflection of the sun off another window – can easily warp vinyl siding. Alternatively, hardie board is denser (usually more than a quarter of an inch thick), just like real wood siding, which makes it much more durable than vinyl. Since it is composed of cement-like materials and wood fibers, it is stronger than vinyl and much less susceptible to wind and weather damage. That said, extremely forceful impacts can cause it to crack. It does not burn, melt, or warp when exposed to heat, though, which is a significant advantage over vinyl siding. Lastly, because hardie board holds up against heat and cold better than vinyl siding, hardie board does not become brittle with age. It usually comes with a 30- to 50-year warranty. The thickness and weight of vinyl and hardie board play a role in the curb appeal each option offers. Because hardie board is so thick, it has deep embossing that looks more like real wood than vinyl siding’s surface texture. 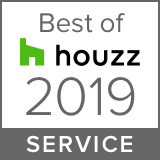 It can mimic many textures, and comes in a variety of color options and trims to match any style – which can be a big advantage if you are looking for a realistic or style-specific appearance for your home. One of the biggest disadvantages of real wood exteriors is the time and cost associated with their upkeep. Unlike wood siding or shingles, which require regular painting and treatment, both vinyl siding and hardie board are relatively maintenance-free. However, vinyl siding does have an advantage when it comes to maintenance. It will not disintegrate or rot over time. It never needs to be painted, and cleaning vinyl is as easy as using a garden hose to wash off any accumulated dust and dirt. On the other hand, hardie board requires painting and re-caulking every five to ten years to prevent deterioration. There is no doubt about it, the advantages of hardie board come with a cost. Vinyl siding is far less expensive, both in terms of the product itself and labor costs to install it. Part of the savings stems from the fact that vinyl is much easier to cut, work with, and install. Hardie board is heavier, thus requiring more installers, and it is harder to cut, requiring specialized training and tools to install. One key factor you may be looking for is energy-efficiency for long-term savings. Neither vinyl nor hardie board offers much insulation on their own, though vinyl can be purchased with built-in insulation – giving it an advantage in terms of energy-efficiency. This insulation can help keep your home cooler in the summer and warmer in the winter, resulting in long-term savings. The manufacturing of vinyl siding is an energy-intensive process, and it creates byproducts that can be harmful to the environment. Hardie board does not produce toxins, making it an eco-friendly alternative to vinyl. However, it is a heavier product than vinyl, which results in more fuel consumption during the shipping process. As you can see, when deciding between vinyl siding and hardie board, there are many factors to consider. What may be important to you may not be important to your neighbors. Vinyl siding and hardie board are both worthwhile investments; they can preserve the look of your home, increase its curb appeal, and provide you with years and years of comfort. Before you make a decision, contact the experts at DryHome. We can walk you through the process and determine which option is best for you and your home!